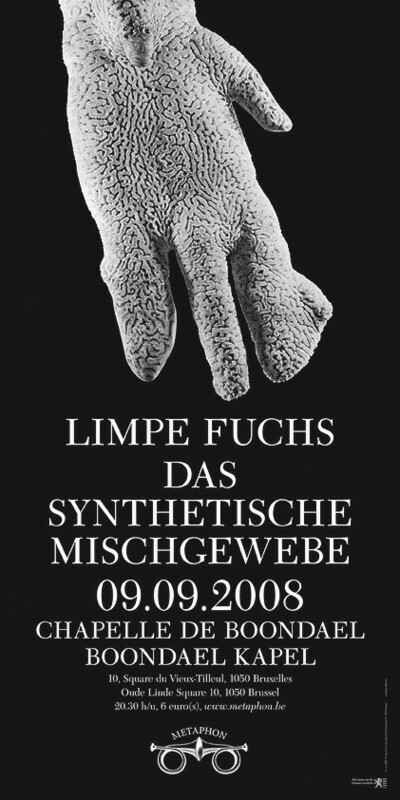 Limpe Fuchs is an improvisor/ composer of acoustic and visual happenings. Born in 1941, studying piano and violin in the early sixties. Started “Anima Sound“, a collective name for twenty years of ‘sound research’ with her partner, sculptor Paul Fuchs. Also known as ‘Anima Musica’, they epitomized the ingenious marginal freak scene of the sixties and seventies and are often cited as a major influence on Krautrock. Das Synthetische Mischgewebe is a multi disciplinary music/performance group founded by Guido Huebner in the early 80’s. Originated in Berlin they took actively part in the experimental/industrial music cassette culture which was a flourishing international underground network at the time. Their music can be described as a composed collage/montage of concrete sounds. In live situations this formula brings a nice combination of spacialised tape music and visual acoustic/concrete sounds generated by various sound objects/sculptures/installations (mixers, raisors, can openers, sewing machines, trains, pumps, fountains and other mechanical toys). With this set-up the group has done numerous succesfull performances in Europe, also Montreal and New York, an exposition in Sao Paulo and a recent tour in Russia. Since 1999 DSM mainly works as the duo of Guido Huebner and Samuel Loviton. However they also did projects with Frans de Waard, Ios Smolders (Imca), MSBR, Artificial Memory Trace,… Over the years they released many albums on cassette, vinyl and CD including an LP on Discos Esplendor Geometrico in 1990 and old cassette recordings rereleased on LP by Vinyl on Demand. Recently DSM also did a collaborative release with The New Blockaders. At metro stop Troon/Trone take busline 95 direction Wiener, exit at Arcades. Following the Terkamerenboslaan/Avenue du Bois-de-la-Cambre for 500 meters you’ll arrive at the Boondael Kapel.